Hindus believe in a multi-faceted ultimate being that takes on different forms and characteristics. The popular phrase 'Hindus have 330 million gods' is a misinterpretation of the basic ideology behind their views on divinity. Hindus believe in one god, or the ultimate reality, with multiple aspects. Each deity, therefore, represents a different characteristic of one being. Some believe that the number represents the concept of infinite forms that god can take, corresponding to the infinite personalities that walk this earth. Hindus can choose one or several aspects to worship as their own individual deity, or they can pray to the corresponding deity when the need arises. For example, someone seeking wisdom would pray to Saraswati. Hindus believe that the world was created and is maintained through three basic forces. These forces are personified by the three main characteristics of the one ultimate reality, also known as Aum. 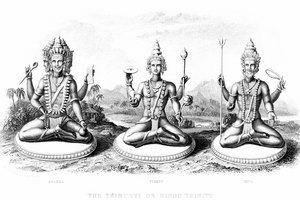 The three characters are Brahma, Vishnu and Shiva. Brahma is the aspect of god that controls creativity and all creative force. It is through this quality that the world was created. Vishnu is the aspect of preservation, and this is the force that maintains the universe. Shiva stands for mercy and compassion. He ultimately dissolves and recreates the entire world when it becomes overrun by the chaos of negative choices. Each of the three pillars or foundational aspects of god have a corresponding goddess to assist them in their mission. Saraswati is Brahma's partner. She is the goddess of learning, knowledge and discernment. Saraswati gives Brahma the necessary knowledge to create the world in perfection. 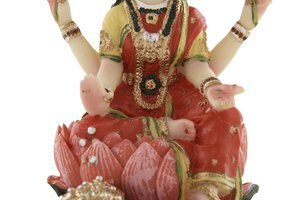 Lakshmi, also known as Shri, is the goddess of wealth and prosperity, both in spiritual and material matters. She gives Vishnu the means to sustain the world. Durga, also known as Parvati, Kali or Ambika, rules morality and righteousness. She is the goddess that assists Shiva, giving him the proper perspective to view the world and the piety to recreate it justly. The three goddesses are a part of the one Aum and are collectively referred to as Mata Shakti, the Divine Mother. 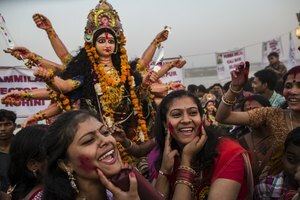 In addition to the core forces, Hindus have a wide variety of other characteristics that contribute to the colorful spectrum that makes up the entire world. 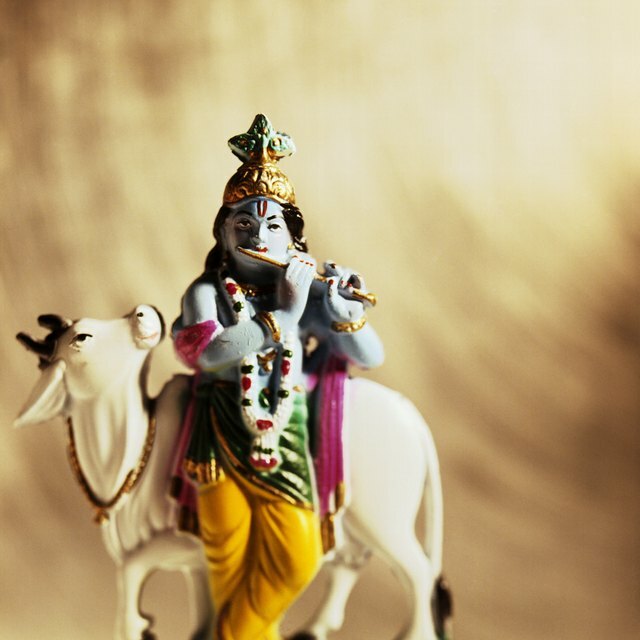 The most commonly worshiped traits can be found in the various entities that Hindus worship. Indra is the god of wind, thunder and rain and the ruler of the heavens. Indra symbolizes the characteristics of courage and strength. Hanuman represents the ideal devotee, possessing humility, hopefulness, admiration, nobility, understanding, mastery of ego, achievements, selfless work in service and profound devotion. Ganesha is the natural force that ensures human success. Krishna is the eighth incarnation of Vishnu. He signifies the love and eternal bond between human and god. Rama is another incarnation of Vishnu, and together with his wife Sita, is the ideal man and woman. 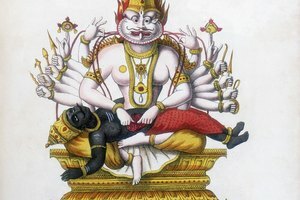 Vishnu had other reincarnations (ten in total) including Matsya, Buddha, Kurma, Varaha, Narasingha, Vamana, Kalki and Parasurama. The purpose of Hindu prayer is to cleanse the mind and soul of impurities and to bring balance and harmony to one's self and the world. Through this process, Hindus believe a person can come close to God. Hindu prayer involves the concentration of the mind to eradicate negative thinking and to open the soul up to the healing and enlightening properties that are contained within prayer. Therefore, a prayer session may contain a variety of mantras, yoga or meditation, each one playing a role in giving the devotee a closer connection to aum. Hinduism is founded upon certain basic principles such as truth, happiness, patience, humility, diligence and generosity, and these principles are voiced repeatedly throughout their prayers. The Gayatri Mantra below is the most central prayer of Hinduism and a perfect example of many of these ideas: "O God the Giver of life, Remover of pains and sorrows, Bestower of happiness, and Creator of the universe. Thou art most luminous, pure and adorable. We meditate on Thee. May Thou inspire and guide our intellect in the right direction." Who Does a Buddhist Worship? Perry, Leah. "Hindu Gods & Their Prayers." 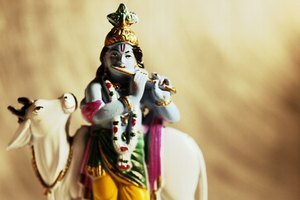 Synonym, https://classroom.synonym.com/hindu-gods-their-prayers-12085681.html. 29 September 2017.